Over the past couple of months I have been fortunate to visit two magical art and ecology institutions in Oregon. In February I stopped for a return visit to PLAYA at Summer Lake (http://playasummerlake.org/) in the heart of Central Oregon at the edge of the Great Sandy Desert. Today I stopped at the Sitka Center for Art and Ecology (www.sitkacenter.org) located on the Central Oregon Coast just north of Lincoln City. Two very different ecosystems that share a magic that can best be described only by being there – peace infusion. I have heard about the Sitka Center from friends here in Eugene who have conducted workshops over there and one who just returned from a 3 month residency. I have been wanting to head that way for a some time – not sure what kept me from going. Today was the day – windy and rainy – iconic Oregon Coast weather. Along the way I stopped at Devil’s Punchbowl between Newport and Lincoln City near Otter Rock. I had hoped for surf large enough to spout up thru the bowl for a dramatic image but the surf was just not big enough to get that to happen. So consider this a scouting trip and I will be hawking the websites for a day when the surf comes round. Still it is always great to be on the Oregon Coast. The above image is just an overview of the area. The next image is of the punch bowl. 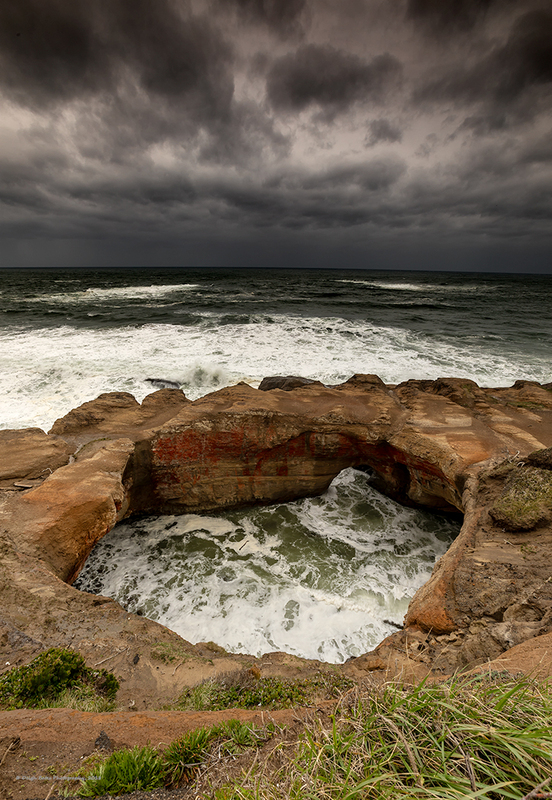 Would love to see the surf come pounding thru that opening and erupting in the bowl. Perhaps next time. I drove on up to the Sitka Center and got a tour from a very gracious young woman named Kimberly. Great location, studio space, quiet and creatively spacious. On the way out I stopped to photograph a small stream that crossed the access road. 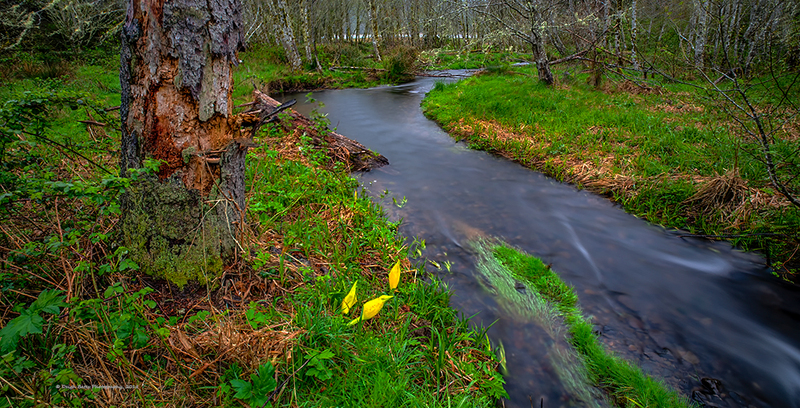 The skunk cabbage is just coming into bloom – love the way they light up the green field. I think the next trip up there calls for an overnight stay – evening and morning light. Thanks for looking.